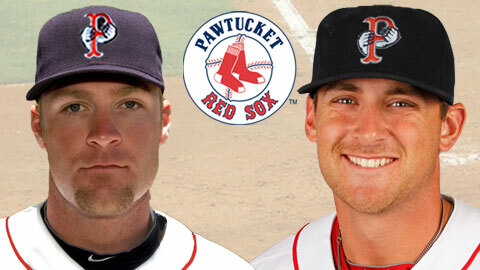 The PawSox today have added 3B Will Middlebrooks, the best batting prospect in the Eastern League (according to Baseball America) from Portland (AA) and also added LHP Greg Smith to their roster as he was signed as a free agent and will make the start tonight vs. Columbus. Middlebrooks, 22, was hitting .302 in 96 games for Portland with 25 2B, 1 3B, 18 HR & 80 RBI. His 80 RBI lead the Eastern League while is average is 8th best and his slugging pct. of .520 is 5th best in the EL. When combined with a 4-game rehab stint he had in Lowell (short-A) at the end of June (.333/3/6 in those 4 games), Middlebrooks overall is batting .303 on the season (6th best in the Red Sox system) along with 21 HR (3rd) and 86 RBI (most among all Red Sox minor leaguers). He was on Portland's disabled list from June 11-26 with a right triceps strain. With Portland he played 85 of his 96 games at 3B (the other 11 as the DH). Other than a dip in May (.237) he has been very consistent batting .347 in April, .371 in June, .302 in July, and .311 thus far in August. His best power numbers came in July when he had 6 HR & 29 RBI in 26 games (the 29 RBI a Portland franchise-record for July). He has also been clutch...with runners in scoring position he is batting .364 (44-for-121) and with RISP w/ 2 outs he hit .391 (25-for-64). Most recently he has hit in 10 of his last 11 games at a .356 clip (16-for-45) with 3 HR & 14 RBI. Will was selected by Boston in the 5th round of the 2007 draft out of Liberty Eylau (TX) High School. Last season he was a Carolina League All-Star for Salem (A) when he hit .276 with 31 2B, 2 3B, 12 HR & 70 RBI. He was also rated by Baseball America as the best defensive third baseman and for having the best infield arm in the Carolina League. Greg Smith, 27, has been with Scranton/Wilkes-Barre from mid-June through mid-August posting a 3-3 mark with a 4.84 ERA in 13 games (10 starts) for the Yankees - 57.2 IP, 68 H, 34 R, 31 ER, 27 BB, 36 SO. In his last 4 starts since July 23 he is 1-1 with a 3.47 ERA (9 ER in 23.1 IP). Smith has pitched in the big leagues with Oakland in 2008 (7-16, 4.16 in 32 GS) and Colorado in 2010 (1-2, 6.23 in 8 GS). The LSU product has a 38-26, 4.13 record in 102 minor league games.